As you may recall from our recent announcement, unfortunately we will not be able to open our eco-resort, Mustang Monument, this year due to the interference of the Bureau of Land Management (BLM) and other government entities that effectively preclude us from obtaining the necessary permits. On the heels of our announcement, the BLM sent out its own press release containing two very revealing numbers; first it indicated that the current Wild Horse and Burro Program was spending $50,000 per horse for horses kept in holding for their natural lifetime, and second, they currently had 100,000 horses that fell under the umbrella of this financial responsibility. Simple math informs all of us that the BLM will spend $5 billion dollars of taxpayer money supporting a program that by their own admission is a failure. In recent testimony before a House Committee just last week, the BLM Director, Neil Kornze, advised members of Congress that 60% of the BLM’s budget for wild horse management was being consumed by care for horses in captivity, up from 46% in 2000. This number staggers the mind when you consider that the BLM has been advised for years from experts on all sides of the issue to find more innovative ways to manage wild horses on the range, rather than to continue to gather and stockpile horses in holding pens. In the same hearing, Congressman Calvert, the Subcommittee Chairman, advised Kornze to “keep the agency driving for a solution that allows the BLM to spay and neuter wild horses on a permanent and broader scale,” in the interest of keeping more horses where they are. As you know, I started our eco-resort with the specific intention of giving these mustangs a place to live free and wild. I went to Washington, D.C. and explained my plan to Senator Harry Reid and Senator Diane Feinstein. Both of them encouraged me to go buy the land and stated if I did, they would support the project. I put my own money up to purchase the land and to improve it so that it could support the mustangs and other wildlife, rather than being dedicated to continuous cattle grazing. Again, I did so only after to speaking to countless elected officials, who assured me that they recognized the benefits, on both the financial and moral side of the equation. I can’t help but ask where they are now. The ranch I purchased has the ability to keep thousands of mustangs on it, manage them in a way that allows them to remain there instead of being placed in holding pens at $50,000 per horse, and save the BLM and taxpayers millions and millions of dollars. What I have presented is the classic opportunity to leverage private dollars against federal dollars to accomplish a goal everyone states they are seeking in the wild horse and burro management arena, yet I find myself stymied at every turn by the BLM finding ways to delay or outright stop the project. This is because the BLM is NOT truly committed to finding new management solutions to managing wild horses; the only thing they understand is gathering and holding horses in pens. The BLM argues that there are 60,000 wild horses on the range today. That number is not supported by any accurate census modeling and, in fact, totally ignores the fact that there is a natural attrition rate of 20-25% per year. Of course, this attrition rate is reduced significantly when the horses are placed in domestic holding pens, another argument for keeping more horses on the range through creative management solutions. As a taxpayer and an American, it is time for you to speak. It is time for you to call to account those who waste your money and who seek to destroy the great example that these mustangs represent. Contact your elected officials and let them know that this waste should not be permitted. 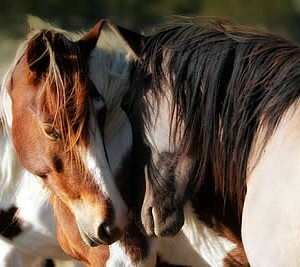 Let them know that you support the right of the mustangs to live free as great symbols of America. Take action today by writing to any or all of the names listed below. Ask Senators Reid and Feinstein why they have abandoned support for the Mustang Monument project.